If you've made your way over to the new Big Picture Classes website and seen the new online scrapbooking classes, cardmaking classes, and other paper crafts classes there, you know how beautiful the site is and how some of your favorite former BPC teachers (including the fabulous Stacy Julian) are still there. You may also notice some new faces and talent there. You've also seen how user-friendly the site is and how great the content is. But maybe you haven't noticed what an a.m.a.z.i.n.g. deal you're getting there. A membership to the new Big Picture Classes costs only $9.95 per month and gives you access to EVERYTHING on the entire website--every class, every gallery, forum, group, the shop...everything. Multiply that times 12 months in a year and you're spending less than $120 per year on learning from the best designers and teachers that the industry has to offer! Some of you may be fans of the old Big Picture Classes platform and enjoyed the online scrapbooking classes, cardmaking classes, and paper crafts classes there. You paid per class and only had access to the classes you paid for. Maybe you purchased one of the 4 Experts classes each year? You may have spent up to $200 per year on classes. This new site is definitely worth your money. *Free month trial promotion ends August 5th, 2015 at 11:59 pm EST. First month free offer valid only on new memberships and is not valid for current or previous members. Click the “Start Your Free Trial” button and follow the steps to begin your free trial. Enter promo code in promo box and continue checkout process. Not valid on previous purchases. Must enter promo code at checkout. Refunds will not be issued for misused or non-entered codes. While you're there, be sure to check out the May installment in my Document 2015 series. 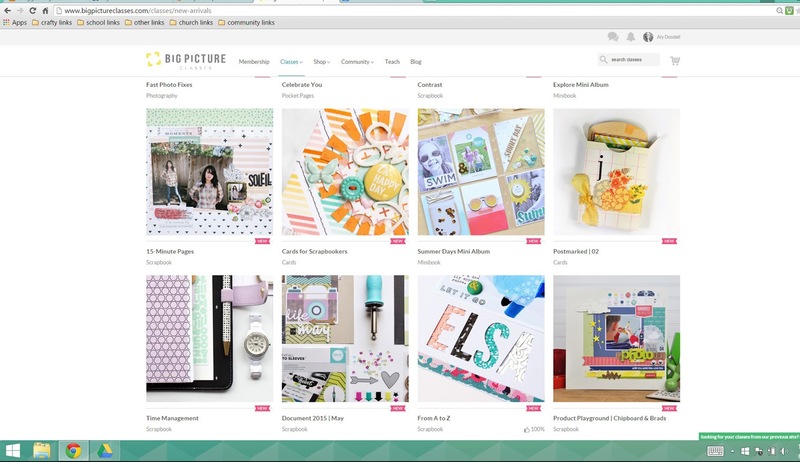 I'll show you how to use the awesome new Photo Sleeve Fuse Tool on a traditional layout. Confetti pocket anyone?